Ever since I wrote about the MPFI Technology , I wanted to cover CRDI also. In this article, I have used simple words and terms that help you easily understand how things work with CRDI / CRDe / DICOR / TDI etc. If I have to draw an analogy, I would say CRDI is for Diesel Engine as MPFI is for Gasoline/Petrol Engine. 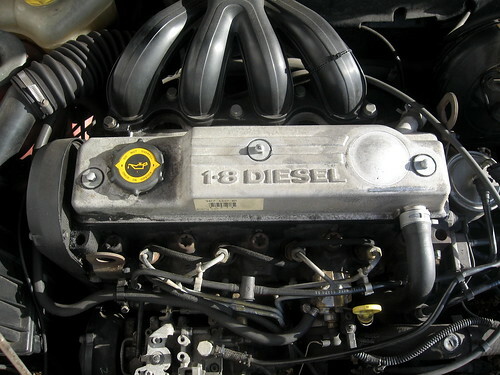 CRDI is an intelligent way of controlling a diesel engine with use of modern computer systems. CRDI helps to improve the power, performance and reduce harmful emissions from a diesel engine. Conventional Diesel Engines (non-CRDI engines) are sluggish, noisy and poor in performance compared to a CRDI engine. CRDI or common rail direct injection system is also sometimes referred to by many similar or different names. Some brands use name CRDe / DICOR / Turbojet / DDIS / TDI etc. All these systems work on same principles with slight variations and enhancements here and there. CRDI system uses common rail which is like one single rail or fuel channel which contains diesel compresses at high pressure. This is a called a common rail because there is one single pump which compresses the diesel and one single rail which contains that compressed fuel. In conventional diesel engines, there will be as many pumps and fuel rails as there are cylinders. As an example, for a conventional 4 cylinder diesel engine there will be 4 fuel-pumps, 4 fuel rails each feeding to one cylinder. In CRDI, there will be one fuel rail for all 4 cylinders so that the fuel for all the cylinders is pressurized at same pressure. The fuel is injected into each engine cylinder at a particular time interval based on the position of moving piston inside the cylinder. In a conventional non-CRDI system, this interval and the fuel quantity was determined by mechanical components, but in a CRDI system this time interval and timing etc are all controlled by a central computer or microprocessor based control system. To run a CRDI system, the microprocessor works with input from multiple sensors. Based on the input from these sensors, the microprocessor can calculate the precise amount of the diesel and the timing when the diesel should be injected inside the cylinder. Using these calculations, the CRDI control system delivers the right amount of diesel at the right time to allow best possible output with least emissions and least possible wastage of fuel. The input sensors include Accelerator Pedal Position (APP) sensor, crank position sensor, pressure sensor, lambda sensor etc. The use of sensors and microprocessor to control the engine makes most efficient use of the fuel and also improved the power, fuel-economy and performance of the engine by managing it in a much better way. One more major difference between a CRDI and conventional diesel engine is the way the fuel Injectors are controlled. In case of a conventional Engine, the fuel injectors are controlled by mechanical components to operate the fuel injectors. Use of these mechanical components adds additional noise as there are many moving components in the injector mechanism of a conventional diesel engine. In case of a CRDI engine, the fuel injectors are operated using solenoid valves which operate on electric current and do not require complex and noisy mechanical arrangement to operate the fuel Injection into the cylinder. The solenoid valves are operated by the central microprocessor of the CRDI control system based on the inputs from the sensors used in the system. So if I summarize it, CRDI works on intelligently controlling the Diesel Engine by using sensors and microprocessors. It replaces some of the mechanical components with intelligent electrical and electronic systems which improves the power, response, efficiency and performance. It also reduces the noise, emissions and vibration levels to a considerable extent. I hope I have used simple words so that you don’t get confused in the technical jargons. What is MPFI In Simple English? What is GDI (Gasoline Direct Injection)? What is Turbocharger? What is Supercharger?